G.P. Putnam's Sons Books for Young Readers, 9780399233623, 48pp. Is there anything Pete won't eat? Poppy Wise's sweet but unruly dog starts with Nico's accordion and works his way through the alphabet, making a nuisance of himself by leaving nothing untouched, not even glue sticks or Uncle Norman's underpants. Despite Pete's ravenous ways, a frazzled Poppy Wise can't help loving him. 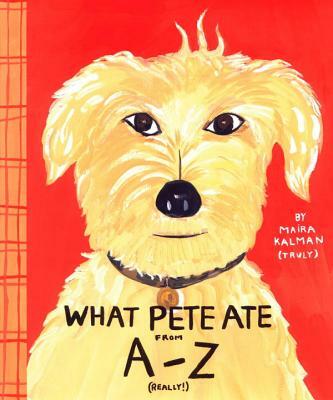 Kids will laugh at Pete's impossible cuisine, adults will appreciate the offbeat sense of humor, and both will love the artwork that perfectly captures the fun of the text in this unique alphabet book only Maira Kalman could create.